Capsule bedding? What does that mean? I’m asked about my bedding frequently and the truth is- most of it isn’t cheap. But, I’m also not switching it out every couple of months. Actually, for the most part, I’m not even switching it out every couple of years. There are a lot of places I’ll skimp but after years of trial and error, bedding isn’t one of them. I’ve invested and upgraded over time and have had some of our favorites for the past half-decade. I would rather save for quality, versatile pieces that I can mix and match than crowd my already-filled closets with season-specific bedding. (For extra bedding you do store, check out my linen closet post HERE and see how I maximize space and store my bulky quilts and comforters). I’ve talked about my approach a lot – and even shared my most used bedding in the “Power Couple” post HERE. And then recently, it hit me. Have you heard of “capsule wardrobes”? They’ve been around for decades but made a resurgence in popularity over the past couple of years. The idea is that you only need a limited amount of separates to be able to keep your look fresh throughout the seasons. You minimize your closet by investing in a few quality, timeless staples that can be mixed, matched, and layered for totally different looks. That’s my exact approach to bedding! 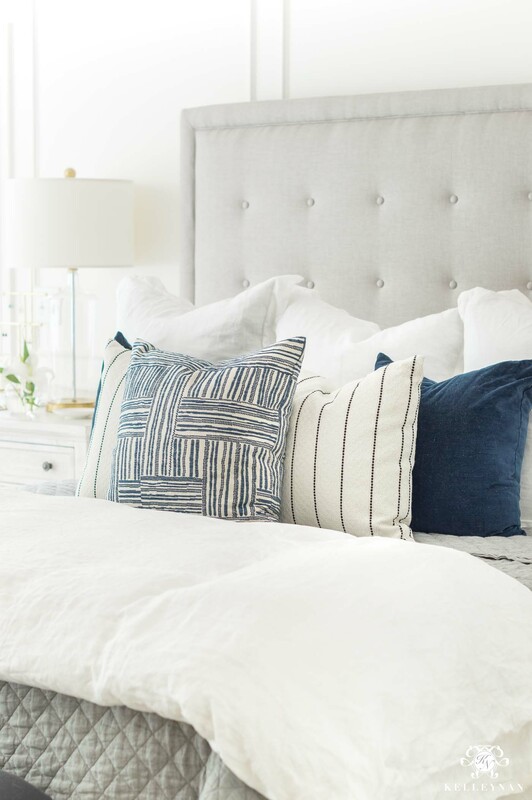 Today, I’m sharing key pieces to create your own arsenal of capsule bedding and how to make your bed with ideas on mixing, matching, and layering for ongoing fresh looks. 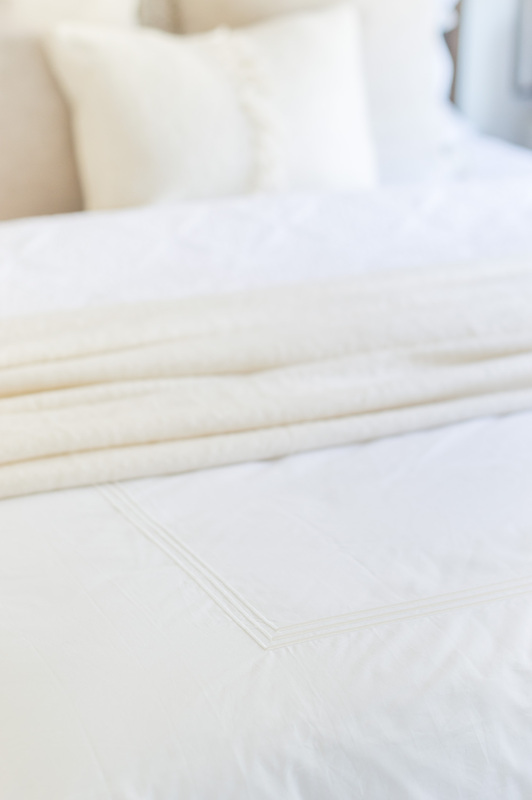 First, let’s take a look at the bedding basics. 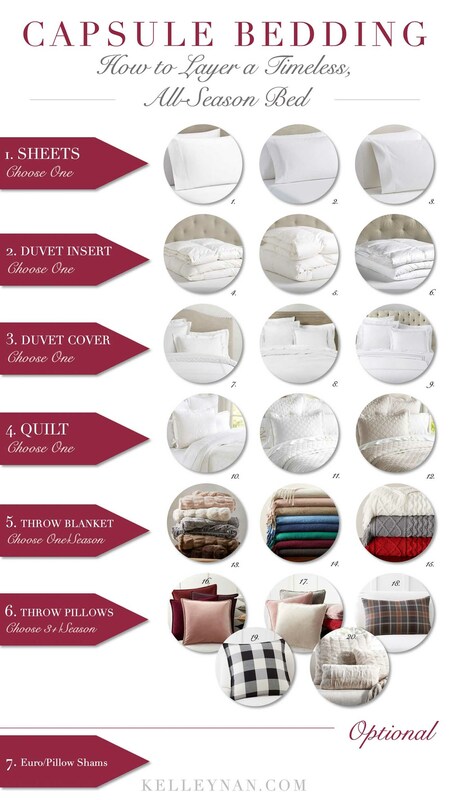 Numbers 1-4 are the primary pieces that will serve you and your bed year-round, while 5 and 6 will be the “extras” that you can layer in seasonally for different looks. With a capsule bedding ensemble, layering is the name of the game but keep your expectations in check. Adding a throw at the foot of your bed isn’t going to immediately make it look like a catalog double. Most retailers use multiple inserts inside duvet covers to make them extra plump, and even pile on several quilts and comforters; they’re gorgeous in the mailer pages, but more often than not, would be totally silly in real life. Basically, the equivalent of Joey wearing all Chandler’s clothes 😉 But, there is a purpose to real-life layering. Typically, I have my quilt pulled over the entire bed but keep my duvet folded at the foot for extra cool nights. If you are cold natured, you may prefer the opposite. Here’s a breakdown and look at what all the pieces look like together. For the guest bedroom, I recently switched my blue and white striped duvet cover to this white duvet cover, reminiscent of luxe hotel bedding. I wanted a totally clean backdrop for the upcoming Christmas season, after a few seasons of feeling “stuck” and backed into one color palette. See what I mean? 😉 The 400 TC organic sheets and duvet cover are “Fair Trade Certified”, a program benefitting the communities of those in which the factories reside. 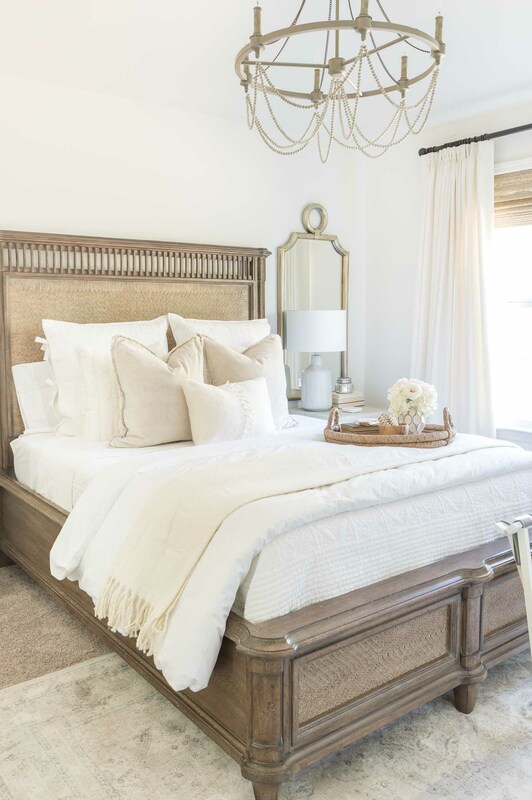 You’ve probably noticed the little emblems on the tags of items in-store or when you’ve surfed around the Pottery Barn website, but may not have known what they meant (you’ll see it on a lot of their organic bedding, metal furniture, and even my olive wood bowls – as pictured on the tray and nightstand in this bedroom). You can see a post that more thoroughly explains the standards to which they’re held, the constituents to whom they serve, and how Fair Trade Certified items provide opportunity and support workers, farmers, and communities worldwide HERE and see PB’s product collection HERE. 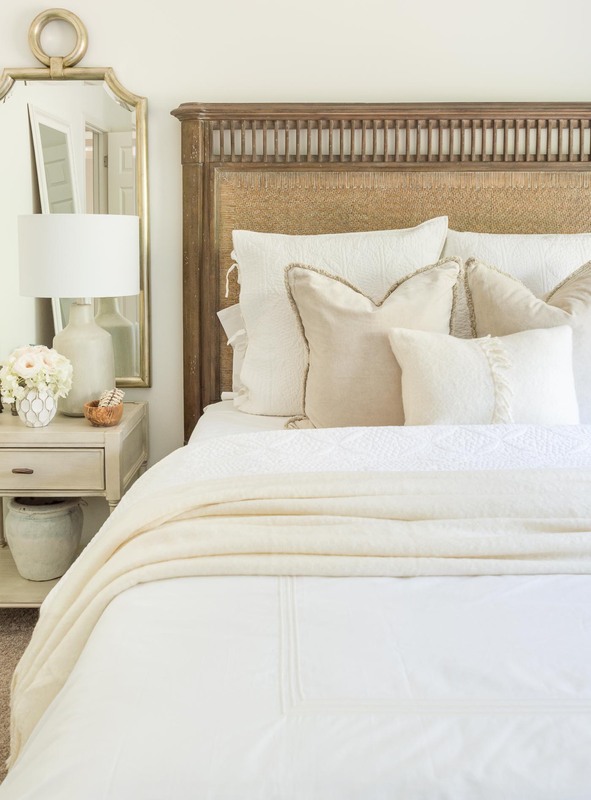 When you’re using the same core pieces, it can be hard to envision how much you can really alter your look, but it can be done – not just through accent colors and patterns, but by the order you layer your bed and how you layer your bed. 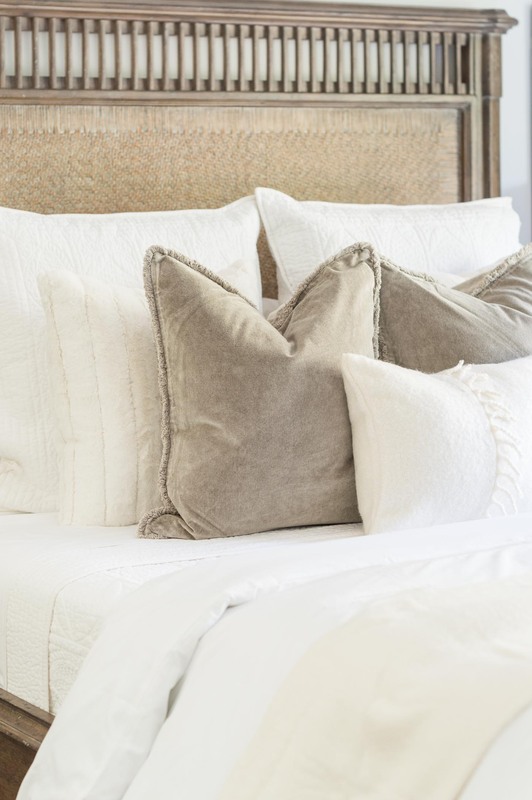 My easy, fail-proof pillow configuration go-to is euros in the back (two for a queen-sized bed, three for a king), a pair of throw pillows (20″-22″), a second set of throw pillows (20″-22″) met slightly more toward the middle, with a short lumbar pillow in the center. With the quilt pulled all the way up, I’ll usually keep the duvet folded at the foot and topped with a throw. 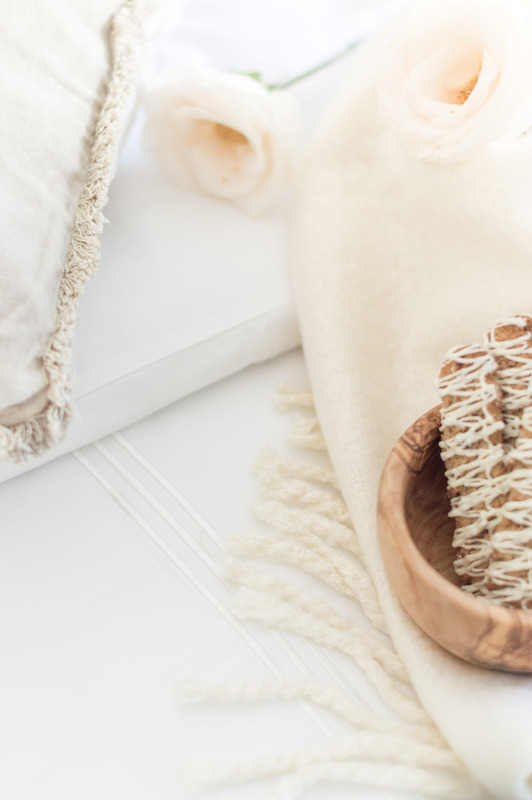 I have THIS throw (pictured) in multiple colors; I love it because 1. tassle-y fringe! and 2. unlike many, this is long and will drape all the way across the bed. It’s also on sale right now. But, there are tons of ways to mix it up. Switch between the quilt and duvet with which spans the bed and which is folded. You can tri-fold, bi-fold, or just barely fold the top down. You can place the upper layer close to the pillows or at the foot; you can ruche your layers instead of folding, or, fold them all down together. Here are a few ideas; the layers are switched up but the staple pieces are the same, with a couple new accents introduced. 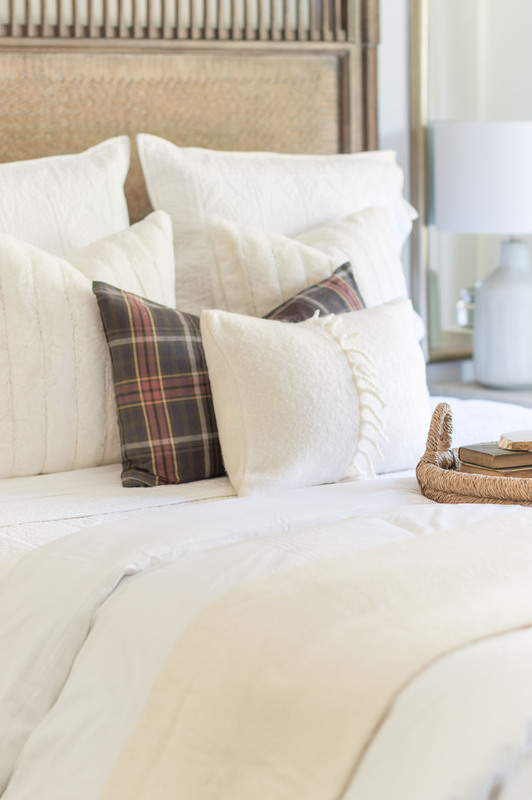 And even though the guest bedroom is currently in a neutral state, you can get as bold as you want in your accents, like coupling THESE plaid pillows with THIS red pom pom throw. 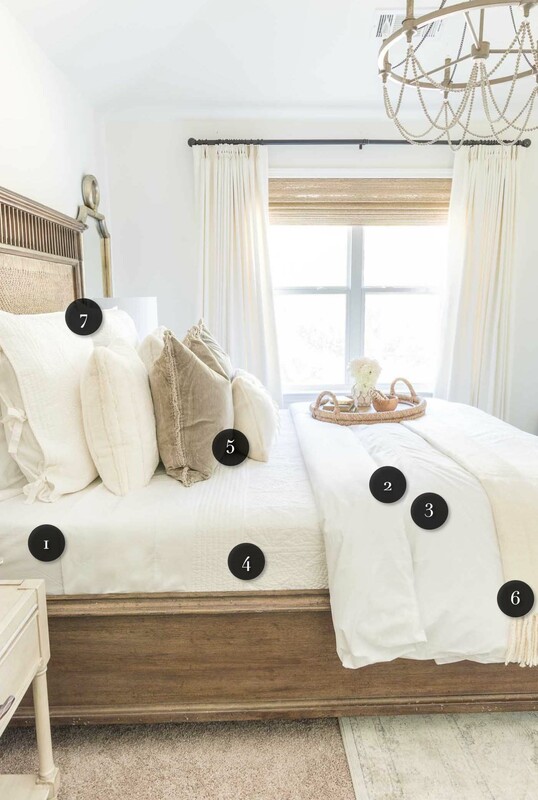 You can see more on my neutral bedding basics and how I bring in an occasional “punch” throughout the year to mix things up in my post HERE. 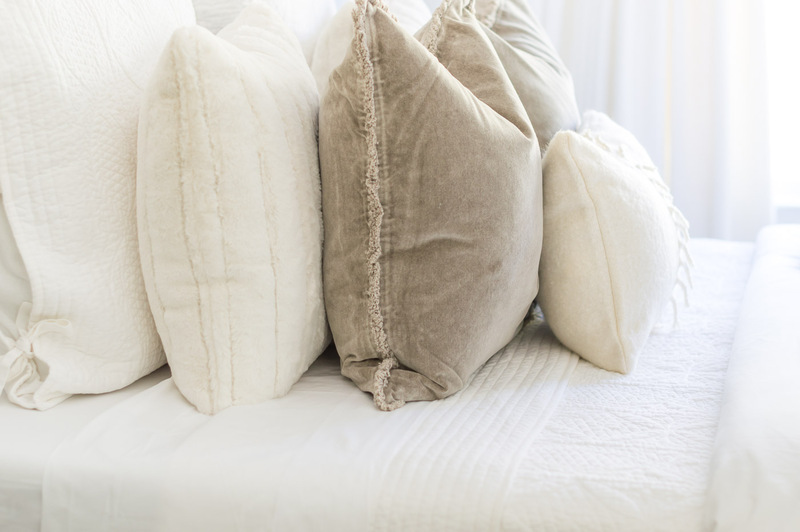 And if you’re in the market- good news 😉 Most throw pillows and throw blankets are on sale today and the Buy More, Save More event was extended through tonight (up to 30% off, plus free shipping with code SAVEMORE). Have bedding separates you swear by? Incorporating some color pops for Christmas? Tell us about it in the comment section and stay tuned for holiday content launching later this week! This post is so well written and holds so much useful information. Thank you for writing it. Cathy, you are so kind- thank you! Hi Kelley! I was wondering you mind if I ask where you purchased those beautiful mirrors above your nightstands? Hi Kelly. I love the fringed velvet pillow from Potter Barn. Would you mind telling me where you got the inserts, and what size you used. I love your inspirational blog! Thanks for the inspiration!! 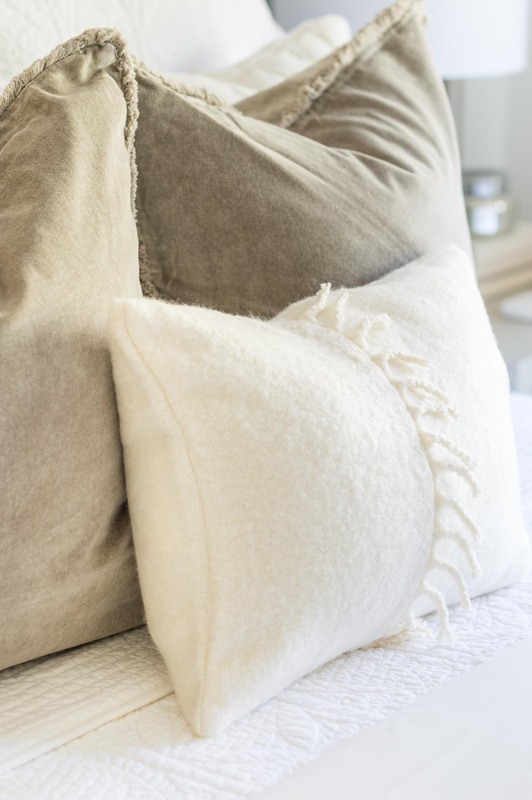 What color are your fringed velvet throw pillows? My sheets and bedding are ivory and not sure if I should do the mocha or cream ones. Thanks! 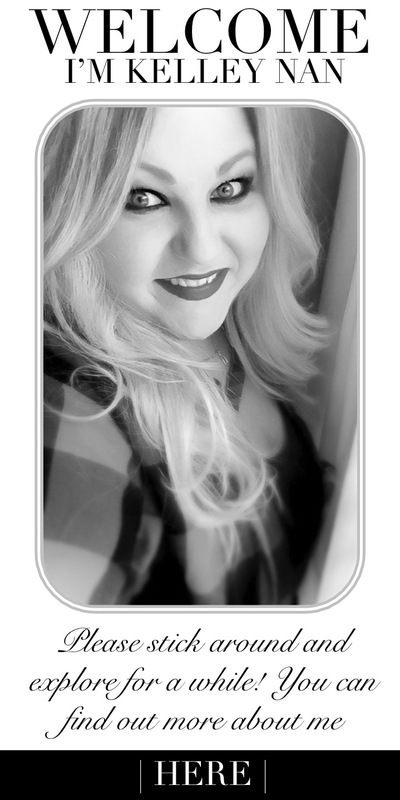 Kelley – I just discovered your blog and love it! Thanks for sharing. 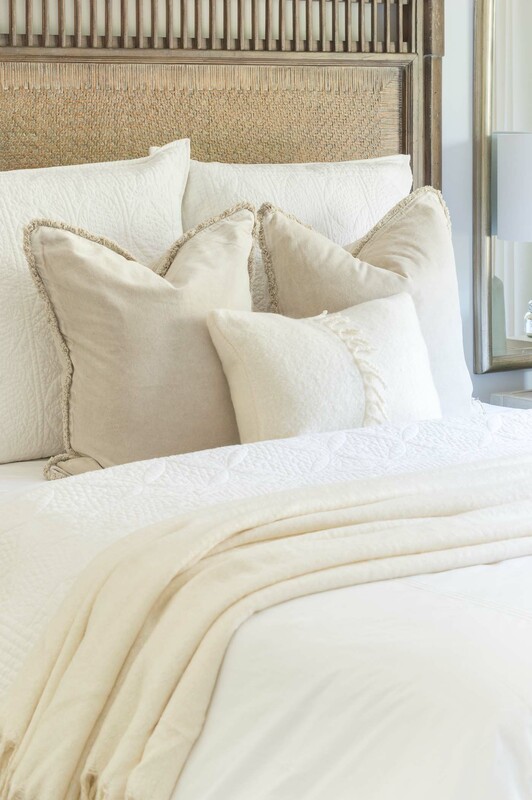 The Hannah quilt and shams, are they white or ivory? Thanks! Hi! I love your bed?? Can you tell me the name and brand? Even if they don’t make it anymore, maybe I can find a used one or a similar in the same brand!! Hello! I love this article but I was hoping that you can tell me the difference between the Duvet Insert and the Duvet Cover? Is one lighter weight than the other. I love the layered look! Hi, Christa! The insert is the actual filled comforter-like inside. The cover is what covers it. You can’t have a cover without filling it with the insert. Hello. Thank you for the tips. I’m about to remodel our master suite and want to change up our bedding. I love the way your bed looks, but where are the pillows you sleep on? I assume you don’t sleep in the shams or throws 🙂 I currently keep our king size pillows stacked (we have 2 each) behind the Euro shams. What did you do? I don’t see any. Thanks!